On the way home from work, I heard Patrick crayton and Jesse Holley on Ben and skin claiming that Garrett totally sabotaged wade, also that crayton was released because he was making Garrett look bad in meetings because he would come up with better offensive ideas. Honestly, I'd give this idea a lot more credence if it wasn't Holley (who has proven himself pretty dumb in post game analysis) and crayton saying it. I've been saying that since he got Wade fired. It's one of the primary reasons that I don't like Redball. Wade was just too dumb to see it coming. Garrett's play design really is not that creative. He's pretty conventional. Maybe even a tad old fashioned. But know what? So is most of the league now. After so many decades and decades, there is only so many ways to come up with new things, be creative, or even just be different from the majority. At some point, just about everything has been done in some way. That point, has been the last 7 or 8 years. And those that try to be different or creative, are really just rehashing stuff that was thought to be outdated or not work well in the NFL, such as the wildcat, read option, the pistol, spread base formations and the singleback. So while Crayton is yanking his own chain there, there is some merit to what he is saying. Garrett isn't creative. But no one really is anymore. I am laughing at the concept of Crayton having any ideas whatsoever. In no way am I saying that Redball is a master craftsman of the offensive caliber. I am, 100%, mocking Crayton. So Garrett sabotaged Phillips. They should have asked if Crayton was on that bandwagon, since it was he that completely whiffed on an easy TD pass vs NYG in '08. SMH. Crayton is such a turd. 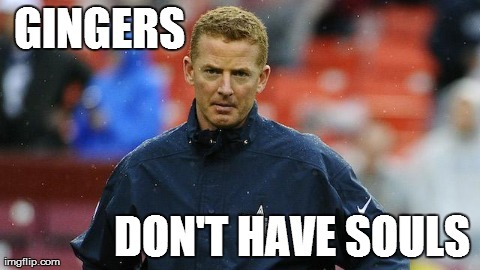 OK guys, realistically speaking, what deals can we expect Dallas to make over the next week of transactions? Its a given that the Ware restructure will happen. Cause they have already started talking about a new deal. Or at least, that's what I've been told. It likely wouldn't be a restructure, but a pay cut. There's a difference. @calvinwatkins: Anthony Spencer has nearly 7 teams interested in him. I bet the "sources" for both of those are the players' agents. Hatcher had a few solid years, 1 really good year, is aging and has a me first attitude. Spencer is coming off microfracture surgery. Any interest in him will be from teams looking to get him cheap.